This article is about destruction of Ramna Kali and other Hindu temples during the 1971 Bangladesh liberation war. Not many know about the genocide of Bengalis (mostly Hindu) at the hands of the Pakistani army in then East Pakistan during the infamous ‘Operation Searchlight’ which triggered the war and eventual creation of Bangladesh. 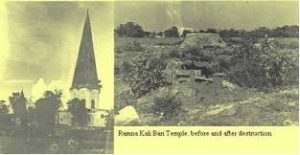 What the barbaric Pakistan Army did to ancient and revered Hindu temples and ashrams during that dark period is even less known. On 26th March, 1971, at 11:00 am Pakistani army entered Ramna temple and Maa Anandamoyee Ashram. They told the residents to not go anywhere. Temple and Ashram residents believed their words which turned out to be a big mistake. Pakistani army came back the next day. They encircled the Ramna temple and Maa Anandamoyee ashram with their supporters at night. The whole area was well lit by the searchlights of Pakistani forces to make sure no one can flee. After entering the temple area they started throwing some kind of explosives (according to some eye witnesses they were firing canons). As a result, the deity’s murti and the back portion of the temple were blown away. Subsequently the whole temple was destroyed. Many people were sleeping and some woke with anxiety when the Pakistani army entered the temple premise. Some people were still taking dinner, they started running. Women started breaking bangles made of conch (Sankha), wiping out vermilion dots and everybody began to shout “Pakistan Zindabad” in panic. Some people went into hiding in different corners of the temple. The Pakistani Army searched them out at the point of bayonet, and made people stand in a line in front of the temple. Woman and children in one line and men in a different line. However the terrorist army made him recite Kalima (Islamic declaration of faith) and killed him afterwards by piercing the bayonet into his stomach and then shooting him. Subsequently many people were made to recite Kalima and then killed in the same way. The remaining men folk were gunned down in a hail of bullets. It is learned from the testimonies of the witnesses that 80-100 people were killed at this time. The women were beaten with guns when they started screaming after seeing this horrible carnage. Many of them turned senseless. Pakistanis heaped the dead bodies together and set them on fire with gasoline. Those who were wounded also perished in the fire. Witnesses mentioned that some women and children were also burnt to death in the fire. Pakistani soldiers forced them to shout “Jai Bangla” when they were shot in the mouth and killed. During the rampage, the Ramna Kali temple and Anandamoyee Ashram was burning. (This was narrated by the eye witnesses to the public investigation committee in Dhaka in 2000). Eyewitness Abdun Ali Fakir, Khadem of Shahabagh Mosque situated not far from Ramna Kali Temple, said that after the terror was started by Pakistani forces, everyone in Ramna Kali Temple and Maa Anandamoyee Ashram was forced to say “Pakistan Zindabad” and also recite “La-illaha illaLlah” (there is no god but Allāh). All the men and women standing in the line uttered those words in united voice and then the shooting started. Kamala Roy used to live in the premises of Ramna Kali Temple and Maa Anandamoyee Ashram at that time. She told the Commission that after the Pakistani Army surrounded from all sides, the women, panicked and scared for their lives, wiped out the sindur (vermilion dot on forehead), and removed sakha (bangles made from conch shell) from their forearms. Men and women were lined up separately. Then the men were mowed down to the ground. Some of them were half dead and screaming for water. Pakistanis collected all the dead bodies along with the half dead people, threw the bamboo fences, taken from the houses, on those bodies and set them on fire. They even threw the children in fire when they found these children running around and screaming in mortal fear. The deputy-editor of Daily Ittefaq Ahsanullah in his testimony before the commission said, “3 days after the incident I saw heaps of burned human skeletons and about 14 rotten deformed human bodies. I saw another 10 bodies in the destroyed temple and Ashram premise”. At the end of April month, that year, they destroyed what remained of the temple and cut many trees in the temple areas. Besides this, Pakistani army destroyed many other temples across East Bengal. 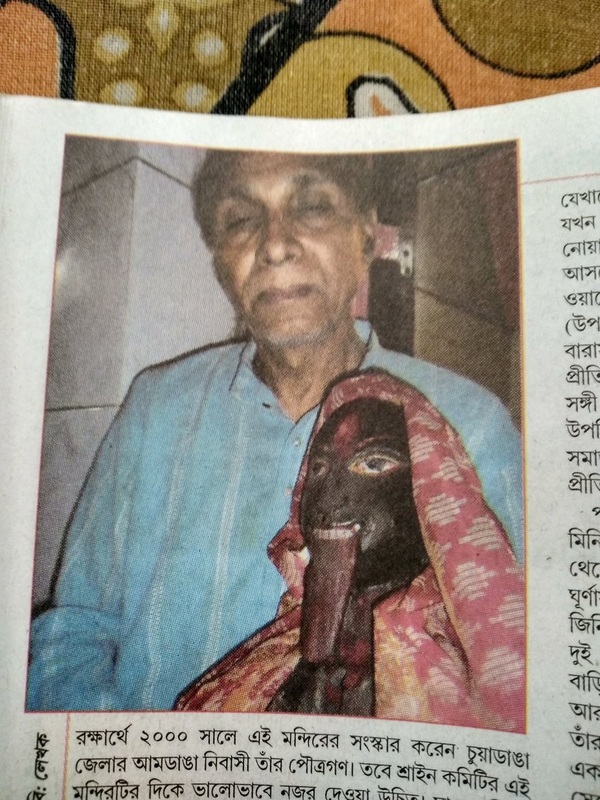 Important among them was Jasoreshwari (which is a Shaktipeeth, however, fortunately the Vigraha was brought to West Bengal; so while the temple was destroyed, the Vigraha was spared), famous Manasa temple established in 1494 CE by poet Bijaygupta of Barisal (then known as Bakla-Chandradwip) and famous Chatteshwari temple of Chittagong. The 350 year old Vigraha made of wood was cut down by barbarians. The priest was shot down and his body was thrown in the middle of the road. Pakistan army also killed 8 monks of Jagabandhu Math at Faridpur town. With the news of their arrival some monks fled the monastery but nine monks refused to leave the ashram. At that time the monks were singing kirtan in the prayer hall of the temple. It is said that the Pakistani soldiers mistook the chants as “Jai Bangabandhu” and their Bihari Muslim collaborators too convinced them that the monks were chanting for victory to Sheikh Mujibur Rahman. The Pakistani soldiers entered the prayer hall and dragged the monks to the open space in front of the temple, beneath the elephant apple tree adjacent to the temple. One monk, Nabakumar Brahmachari escaped and locked himself up in the room beneath the staircase. The remaining eight were made to stand in a line in front the Pakistani soldiers who had already taken position. According to eye witness accounts, twelve shots were fired one by one. The monks chanted “Jaya Jagatabandhu Hari” as they fell down. The soldiers and the collaborators then looted valuables and cash from the ashram. On the next morning, the corpses were taken away by a Faridpur Municipality truck. On 26 April, the Pakistan army destroyed the shikhara of the temple using dynamite. The Mahant of the Ram Thakur Ashram at Kaivalya Dham was also shot down and 10 ashram residents were killed. The holy banyan tree was cut down by the Pakistani Army.